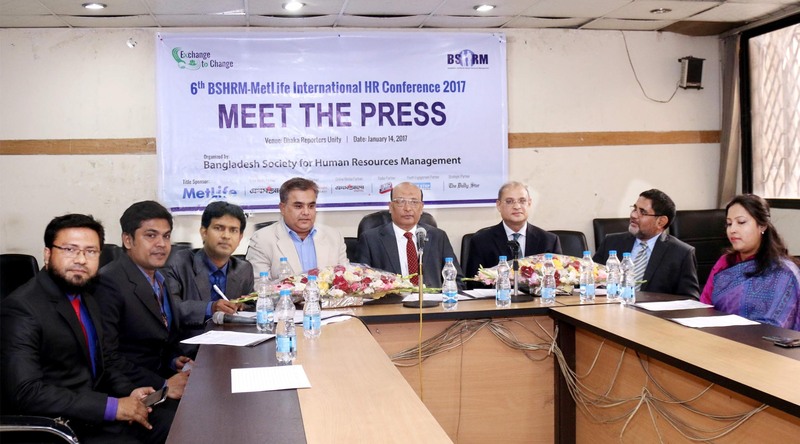 Bangladesh Society for Human Resources Management (BSHRM) organized a press conference on 14th January (Saturday) 2017 at Dhaka Reporters Unity Round Table Auditorium on their biggest event of the year, 6th BSHRM-MetLife International HR Conference-2017 which will be held on 3rd March (Friday) 2017 at Bangabandhu International Conference Centre (BICC), Sher-e-Bangla Nagar, Dhaka. The ultimate aim of HR is to provide leadership through education, networking, shared knowledge, and transfer of best practice across all sectors. In recognition of greater HR, the theme of the 6th BSHRM - MetLife International HR Conference-2017 is “Exchange to Change” and MetLife is the title sponsor of the conference. The press conference was attended by Md. Musharrof Hossain, President of BSHRM, Md. Mashequr Rahman Khan, Vice President of BSHRM, S.M. Zahir Uddin Haider FCMA, Conference Chair, M. Abdullah Al Mamun, Conference Secretary and other high officials of BSHRM and members of Press & Media Sub-committee of the conference. Among others, Md. Jafar Sadeque Chowdhury, Chief Distribution Officer, Md. Mahmud Alam, Manager, Employee Benefits, Md. Saifur Rahman Khan, Senior Assistant Manager, Human Resources, and Faria Mahbub, Senior Officer, Brand & Communications from Title Sponsor-MetLife and representatives from different partners of the conference were also present at the event. Speakers at the conference highlighted the perspectives and the role of human resource development, and to answer the questions of the journalist. They expect that this conference will be a great avenue for exchange of ideas and thoughts, leaning about new developments and generating a good network for continuous improvement. Mr. Henry G. Jackson, President and CEO, Society for Human Resource Management (SHRM), USA, Mr. Md. Musharrof Hossain, President, BSHRM & Asia Pacific Federation of Human Resources Management (APFHRM), Dr. Ajantha Sujeewa Dharmasiri, Professor at University of Sri Jayewardenepura, Sri Lanka & President, IPM, Sri Lanka and Mr. Somesh Dasgupta, National President, National Institute of Personnel Management (NIPM), India will be present as Key Note Speakers in the conference. Besides, many other world renowned HR experts from Bangladesh and overseas will be present as panelist in this conference to enrich the glory of the event. Nearly 1,000 human resource professionals from home and abroad are expected to participate in this conference. For conference registration: 01790444477, 01790444411, E-mail: conference@bshrmbd.org.